ST. PAUL, Minn. (CNS) — Father Rob Hagan has been in Sister Jean Dolores Schmidt’s shoes before. Now an Augustinian priest and Villanova University men’s basketball chaplain, as a student he witnessed the Wildcats’ Cinderella run to the 1985 Final Four and national title. He holds the memory dear as he has made more memories with the program as chaplain over the past decade. “One of the great memories of my life,” Father Hagan said about the Wildcats’ 1985 championship. He reflected on his history and current role with the team a few days before their victory over the University of Michigan, 79-62, April 2 in San Antonio, Texas for the NCAA men’s basketball national championship. Also a basketball team chaplain, Sister Jean, 98, has been serving in that role for Loyola University Chicago men’s basketball team since 1994. She saw the Ramblers’ first national title in 1963 when serving at Mundelein College, which later merged with Loyola. The retired Sister of Charity of the Blessed Virgin Mary has become a media sensation during the Ramblers’ recent run to the Final Four in San Antonio, the program’s first NCAA tournament appearance since 1985. They succumbed to Michigan in the national semifinal, 69-57, on March 31. “It’s wonderful because what it’s doing is just highlighting a lot of the universal values that we all share that sometimes get buried underneath all the other coverage,” Father Hagan said about Sister Jean being in the spotlight. “You have to hand it to Sister Jean. She really has charisma, she has joy, (and) she has a spirit about her. She really is a captivating person in her own right,” he said in an interview for Catholic News Service. 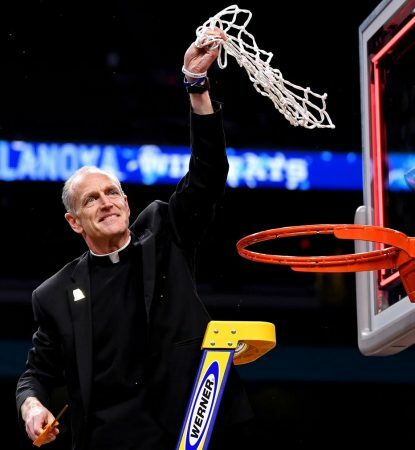 Father Hagan has been Villanova’s basketball chaplain since 2004 and joined the Wildcats in their third Final Four since 2009. He has seen the program become one of college basketball’s elite, which includes a national title in 2016. Father Hagan and Sister Jean bring that to the table in their ministries. Both lead pregame prayers before each contest, but it goes beyond that. Sister Jean emails each Loyola player after games affirming something they did well. A retired sister, she still lives on campus and reaches out to students. Father Hagan offers pastoral ministry to the players in addition to his primary role in the athletic department as associate athletic director. He also serves as chaplain for the football team. He has maintained relationships with players beyond their time at Villanova and has offered the sacraments for some alumni along the way. “You forge these relationships that go beyond to struggles that they might have with injuries, the joys that they celebrate like a marriage or a birth of a child,” Father Hagan said. 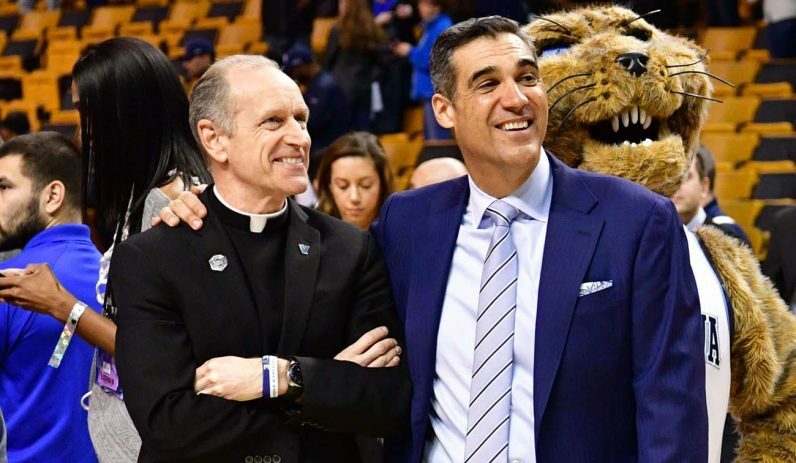 Father Hagan also has a strong friendship with Wildcats coach Jay Wright. Father Hagan said Wright is “not just a coach, he’s a mentor … and places great value and emphasis on family and developing the whole person” in his work. During the season, he offers Mass for the football and basketball team before games and on Sundays and Holy Days. That includes the Easter Triduum liturgies when the Wildcats’ tournament games have overlapped with Holy Week. In 2016, he offered the Holy Thursday Mass for the team during the tournament and washed the players’ feet. Father Hagan planned to celebrate the Easter Vigil Mass for players after the national semifinal game March 31 against the University of Kansas. Villanova’s 95-79 win over Kansas propelled the Wildcats into the final against Michigan, and after that convincing victory, into the history books. Davis is a reporter at The Catholic Spirit, newspaper of the Archdiocese of St. Paul and Minneapolis.